ROUND PREVIEW: Bosnian Vogosca and Israeli Holon meet in a double header Sunday and Monday in the Men's Challenge Cup, where at least two teams are virtually in the next round. Three teams are already in Round 3 of the Men's Challenge Cup. 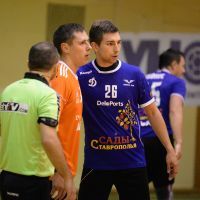 RK Mojkovac from Montenegro got there without having to play, while Handball Kaerjeng from Luxembourg and Serbian ORK Samot 65 qualified by winning double-headers last weekend. Two more teams are virtually in the next round already. A.C. PAOK won as big as 34:17 away against Aloysians Von Taine, which makes it impossible for anyone to imagine that the Greek team do not book the ticket for the next round on home ground Saturday evening. The same goes for RK Konjuh Zivinice who defeated Proodeftikos Paphos from Cyprus no less than 39:15 at home last weekend. Even though the Bosnian side are playing away Saturday, the return match in Cyprus looks like a formality. While Bosnia practically have one team in the next round, the chance to get two teams in Round 3 also still exists. Sunday afternoon and Monday evening, HC Vogosca Poljine Hills are hosting a double-header against Holon Handball Club from Israel. While Vogosca reached the third round of the Challenge Cup the past two years, Holon reached the Last 16 of the tournament in the 2014/15 season, the last time the Israeli club qualified for Europe. Red Boys Differdange have a six-goal lead with them to Lithuania for their second leg match against Kauno Azuolas-KTU Kaunas Saturday afternoon. Back home in Luxembourg, Differdange won 32:26 last Saturday, but the question is if the lead will be big enough in the Garliava Sport Centre in Lithuania's second largest city. Lituania may get two teams on to the next round, but the country is also in danger of having both representatives sent out in this round. While Kaunas are going to try to catch up with six goals at home against Differdange, VHC Sviesa Vilnius only have to catch up with a one goal deficit against Dynamo-Victor – but unlike Kaunas, Vilnius are playing away. Dynamo-Victor won the first match 25:24 in the Lithuanian capital, so the Russian team have an obvious edge before the return match at home Saturday afternoon.